Photos of ceramics, and article interpretation by Robert Kokenyesi, Ceramic Artist, Beachfront Pottery, Godfrey, IL, 62035, USA. If you enjoyed this post, then give me a “like” on my Facebook page. 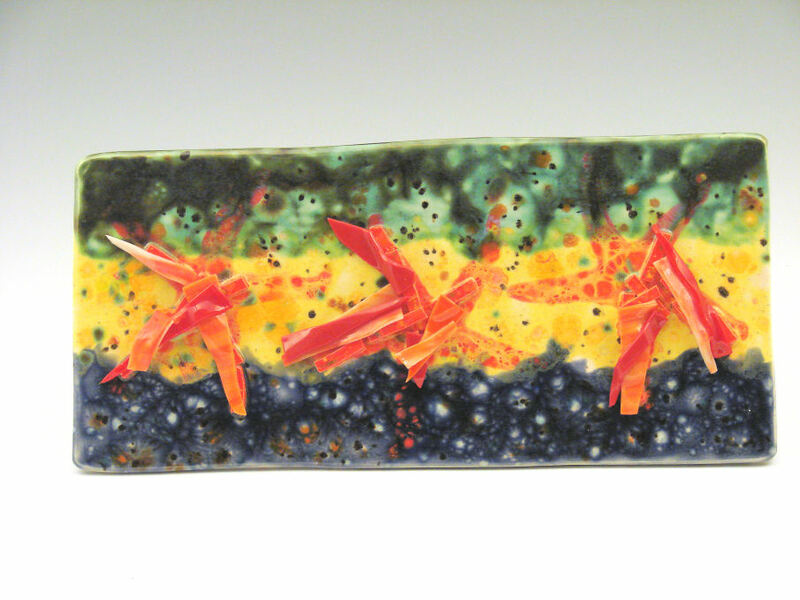 There is additional information about Beachfront Pottery on my web site. 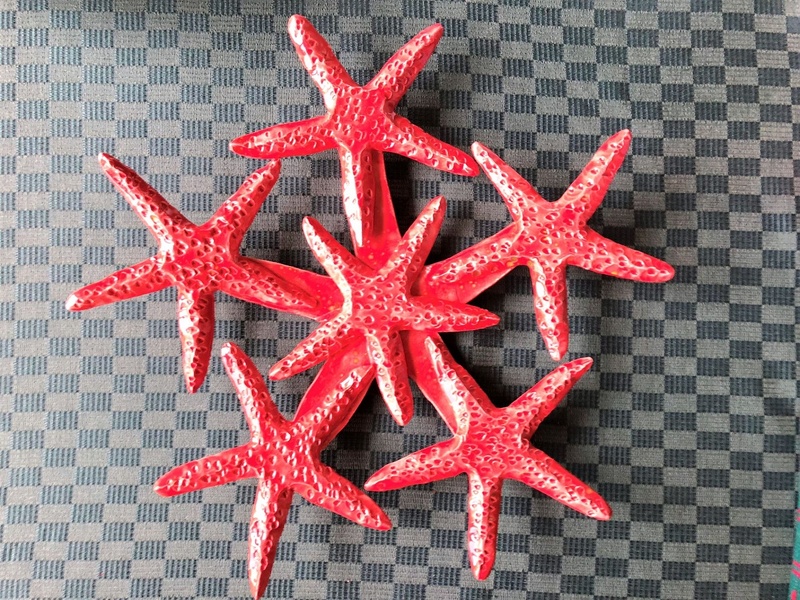 The article gives us an analysis of the consequences of the natural (virus-borne) eradication of sea stars of British Columbia. In 2015 about 96% of the sunflower sea stars, and several other sea star species were killed by the sea star wasting disease. Because sunflower sea stars eat small and medium size sea urchins, in the absence of sea stars sea urchin numbers increased 166%. Because sea urchins eat kelp, the kelp forest declined by 30%. So, controlling of sea urchin numbers by sunflower sea stars promotes growth of the kelp forest. 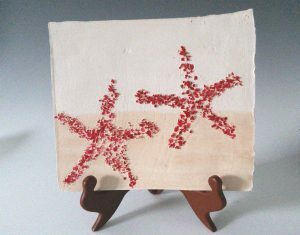 5- arm sea stars have been pictures by Beachfront Pottery. Below are three examples of flat pieces, tiles, where the sea star shape is flat or slightly elevated. The article about the sunflower sea star reminded me of the many shapes and sizes sea stars come. The sunflower sea star have 16-22 arms, and grows to 3 feet in diameter. Earlier in the year I started to explore a 3D expression of sea star trays, bowls and pots. Below is an experimental version. 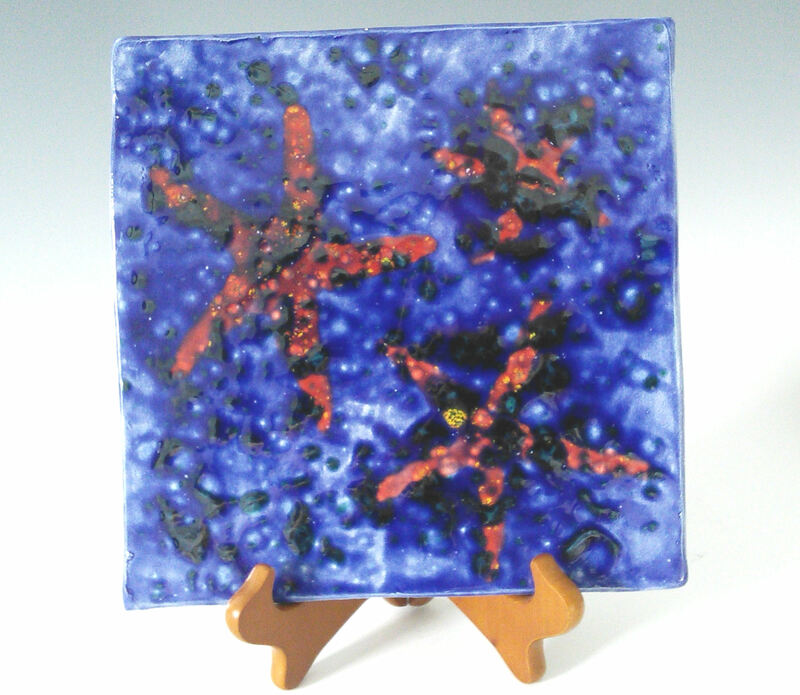 This is an experimental sea star tray using the 5-arm seastar as starting form. 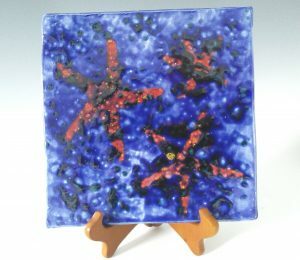 There is a large upside-down sea star to form the base of the tray, and smaller right side up sea stars fill in the spaces of the tray. The next version will have a base with more arms (maybe 16, as the sunflower sea star). With that sort of base it might be easier to fill the spaces between the arms with smaller sea stars.